Acts of Assembly, Chapter 68 [H33] Article 8. George Mason College, March 1, 1966. 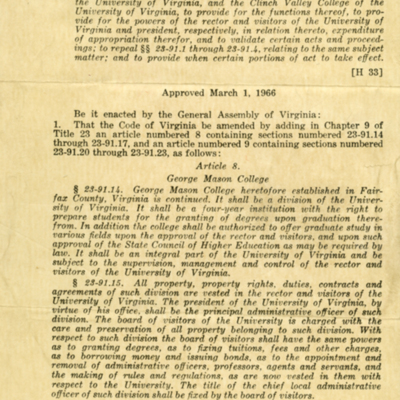 Act of the Virginia General Assembly making George Mason College a Four-year degree-granting institution as approved March 1, 1966. One page. 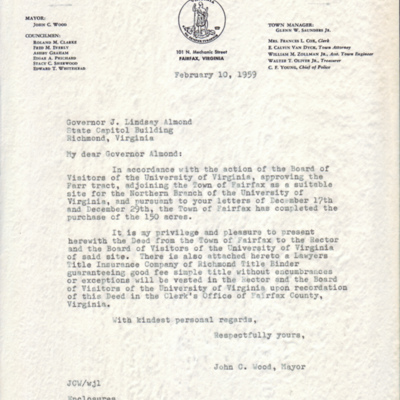 John C. Wood to J. Lindsay Almond, Jr., February 10, 1959. 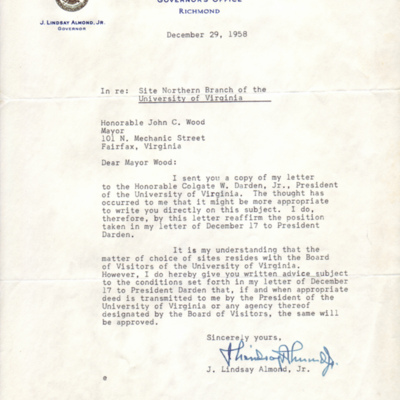 J. Lindsay Almond, Jr. to John C. Wood, December 29, 1958. C. Harrison Mann, Jr. to Francis Berkeley, October 18, 1956. Springfield Committee for the Northern Virginia University Center, September 24, 1956. To the editor.